For the last 2 days I have been working at the much publicized Athletes Village, aka Millennium Water, aka Vancouver’s Olympic burden. The whole development is a triumph of modern architecture, urban planning and should be a shinning example of the Olympic legacy in our city. Unfortunately someone forgot to tell Millennium, the developer of the Athletes Village, that they were supposed to be building something great and that beauty should be more than skin deep. From the outside the project is stunning but once inside the illusion quickly fades away and you are left with poor workmanship and unsellable homes that are priced at the upper end of Vancouver’s real estate market. I was able to view the nearly 4700 square foot penthouse in one of the units recently and was stunned by the quality of finishing and material used in this supposed premium home. I’m not going to go into detail about what building or what penthouse other than to say that I know people who were involved in the building of all of the units and the quality is consistently poor throughout the entire development. Just out of curiosity I decided to do a little comparison shopping in the area between 2 bed 2 bath units around 1100 square feet. At the Village the typical price for something in that configuration runs between $700k and $1.1 million where as a comparable unit closer to Broadway and Cambie runs between $590k and $1.4 million. The lower end is older buildings but the price actually compares quite well which leads me to believe that I am not the only one who noticed the poor quality at Millennium Water. I suppose that’s why Millennium recently went into receivership and I strongly believe that once Ernst & Young, along with condo sales ace Bob Rennie, get a plan together the issues will be solved and the units sold at reduced values. 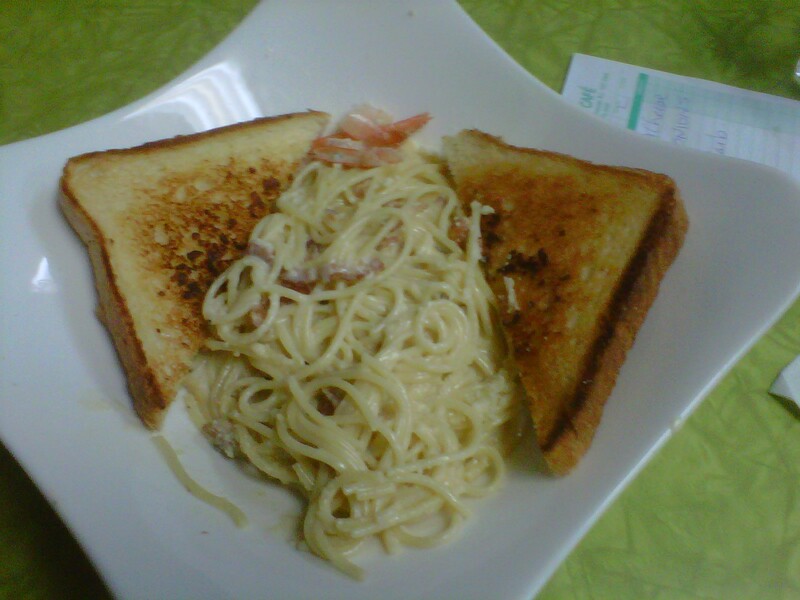 On a happier note I have discovered a great new dive in the same area called Argo Cafe. Located at ﻿1836 Ontario street, just across from the Village, ﻿I am apparently the only one I know who had never been there. I had the House Chow Mein with BBQ pork, chicken and shrimp. What a great Chow Mein!!! Crispy and soft noodles, bok choy, carrots, broccoli and cauliflower, so good from a place that you wouldn’t expect from its outside and inside appearance. You can read more about the history of this great little spot here as well as drool over their menu and read about their upcoming feature on The Food Network. My Movember Moustache is still going strong and I am eagerly looking forward to the Gala Party at Fortune Sound Club on December 2nd. I recently had a little Movember get together with some close friends and raised an additional $300 to add to the $1200 we have raised so far in the fight against prostate cancer. If you would like to donate you can do so here. I am officially dedicating my Movember efforts to the memory of David Lam who was taken from us on November 22nd after a battle with prostate cancer. He was an inspiration to all Canadians and you can learn a little more about him here. Thanks for reading everyone and I hope you have a great week!!! Every now and then life takes you in a direction that you just didn’t see coming. When I started writing about food it was just for me and maybe my close friends and family to find new places to enjoy great food. 6 months later it has snowballed into an amazing second “job” and will hopefully one day occupy enough of my time that I can focus solely on writing. Along the way I have found some great food and this weekend was no exception. As you may or may not know I am a bit of a social media junkie, Facebook, Twitter, Linkedin, Hootsuite, they are all amazing tools for getting your message to potential readers/customers and it just may be the best free advertising you can find, something like word of mouth on steroids. 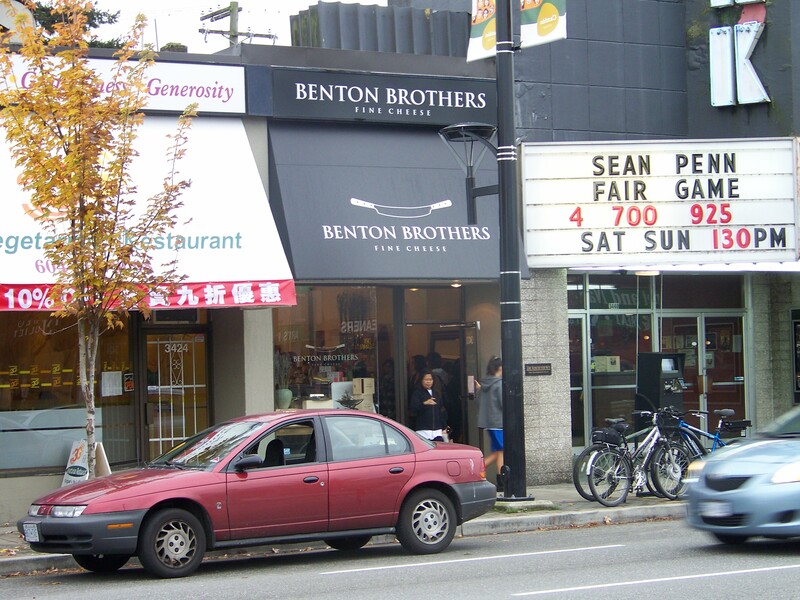 I found Benton Brothers Fine Cheese on Twitter and a few days after following them I received an email saying they were having a Grand Opening at their new location at 3432 Cambie Street in Vancouver. Cheese is usually in most dishes I enjoy provided the type of cuisine and region it comes from use cheese on a regular basis, for example, cheese and sushi do not mix, ever. I hopped in my truck on Saturday afternoon and headed for Cambie street. I had a Seahorses and Stone Roses playlist flowing from my Ipod because as everybody knows, John Squire is the best guitarist of the last 20 years and it seemed like a good fit for a super cool day filled with cheese, wine and roasted bison. 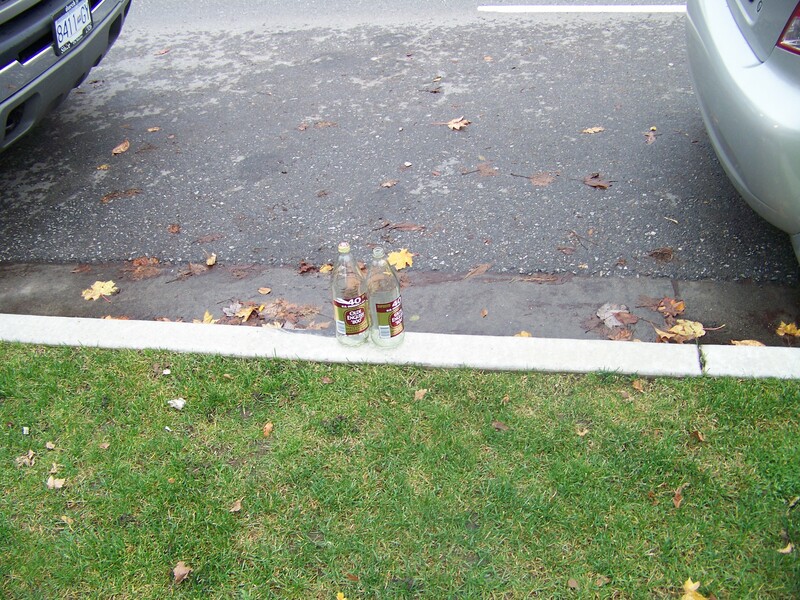 I parked a block away from Benton Brothers and wandered down to the shop, passing 2 empty bottles of Olde English 800 sitting on the curb outside a church reminding me of my misspent youth. As I approached the door I realized this shop was a pretty big deal. The place was packed and the staff was busily readying gourmet cheeses, patés, cured meats and other delights for the excited crowd, all the while explaining where every cheese was from and offering pairing recommendations to go along with the wine and beer samples they were handing out. 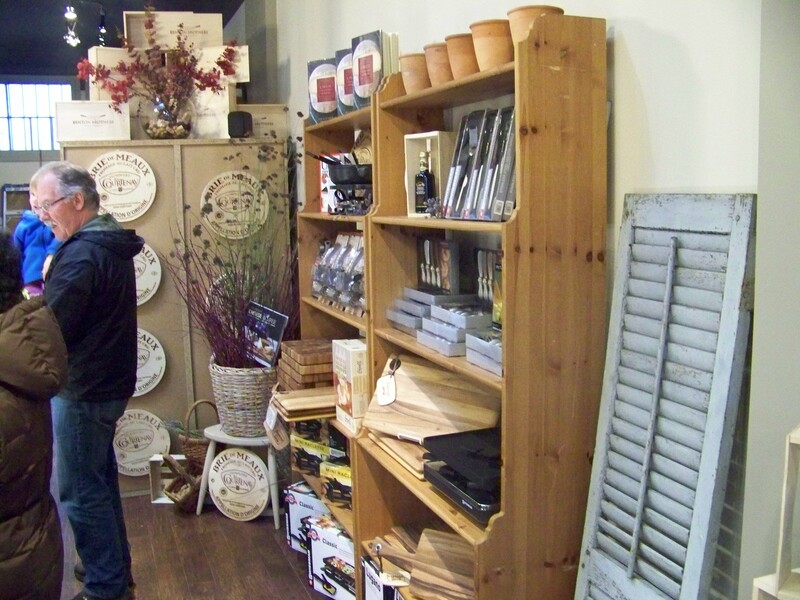 The shop itself is very nice with a very hip, rustic feel very fitting of somewhere you can buy food of this quality. There are also fine oils, cheese knives and other items to accompany the core items along with grilled sandwiches that were too tasty looking for me to pass up. I had to try the Roasted Bison sandwich with blue cheese, romaine, tomato and onions. I also spotted drinks from the Pop Shoppe that I used to drink as a kid. I added a healthy slab of Parmigiano-Reggiano and a container of cheese curds to my order and waited in the line up of happy people leaving with their dairy based treasures. I had planned to introduce myself but I didn’t want to interrupt the flow of fine cheeses from Benton Brother to customer and I know I will be back soon so I quietly paid and slipped out the door to go and eat my roasted bison sandwich and drink my Pop Shoppe Cola. The sandwich was terrific with a great kick from the blue cheese and the bison was like eating shaved prime rib, fantastic. 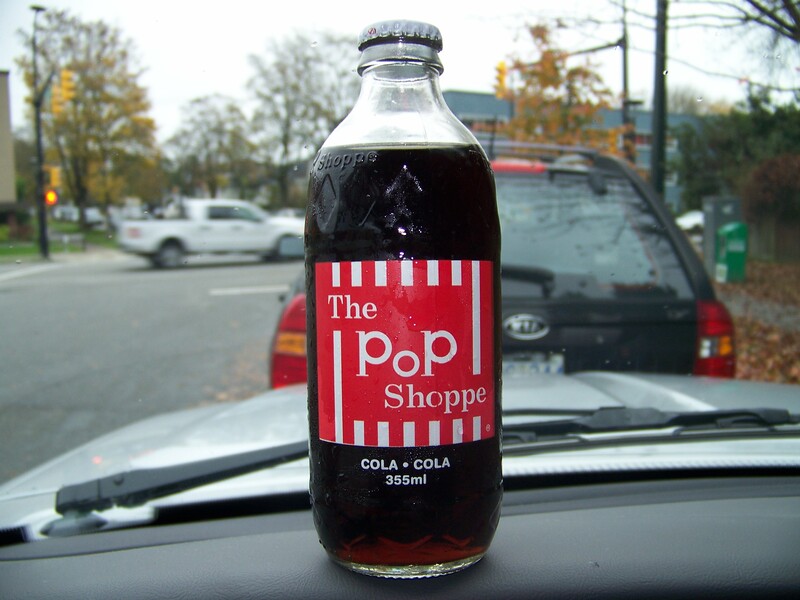 The Cola from the Pop Shoppe was a really great nostalgic moment that made me think fondly of the days when you could get Pop Shoppe soda from the Pop Shoppe itself, you would bring your empties back to where you bought them and they would reuse them, sort of a precursor to todays recycling programs. What a great lunch, I headed back to my home base thinking my anonymity was intact but it seems my camera, my ultra cool wooden eyeglasses and twitter conspired to reveal my true identity. It’s kind of a Bruce Wayne thing…during the week I look like an Elevator guy so most places have no idea who’s Tweeting about their food, but the weekend is another story and I’m kind of obvious. Benton Brothers Fine Cheese is a must for cheese lovers or anybody else who appreciates quality product and great service. They supply some great local restaurants with awesome cheese and give local foodies a friendly and personal alternative to large chain retailers in the search for great food. Their other location, 2104 West 41st Ave, has been around for a while and I have it on good authority that it is just as great. So thanks to Benton Brothers Fine Cheese for inviting me to their Grand Opening, for providing great food to this amazing city and for pointing out that my wooden glasses are super cool, which my wife may not agree with. Find them on Twitter here and follow them on Facebook here but actually go there, that’s what real fans do!!! Nuba is a trio of restaurants offering authentic Lebanese food in Vancouver. One is located on Hastings and Cambie and is a larger sit down type restaurant while the other 2 are more like small downtown cafes with a few tables and take out. 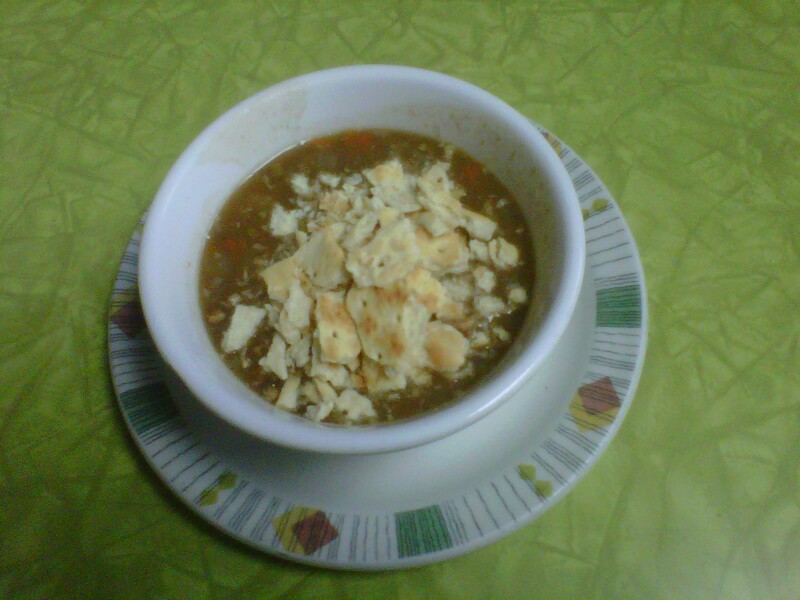 The location at 1206 Seymour street (Seymour and Davie) is the original Nuba and has been in business since 2004. If you have never had Lebanese food you are really missing out on one of the most satisfying cuisines the world has to offer. Although very similar in taste and ingredients to other middle and near eastern food, Lebanese food rarely consists of red meat, other than lamb. Chicken, fresh fish and vegetables make up a large part of Lebanese cuisine and most foods are grilled, baked or sautéed in olive oil as butter and cream are rarely used. Most dishes rely on herbs and spices to elevate common food to extraordinary levels of taste. My coworker and I spotted Nuba while working down the street and decided to walk over at lunch time and check it out. Mike has been to the middle east and had been to Nuba before and swore it was the most authentic Lebanese food in the city. I’m always a sucker for a special or a featured item so i decided to sample the Pulled Braised Chicken Musakhan Pita. Wow…Musakhan is something I didn’t know existed but I’m a better foodie for having sampled it. It is made of chicken baked with onions, sumac, saffron, all spice and fried pine nuts. 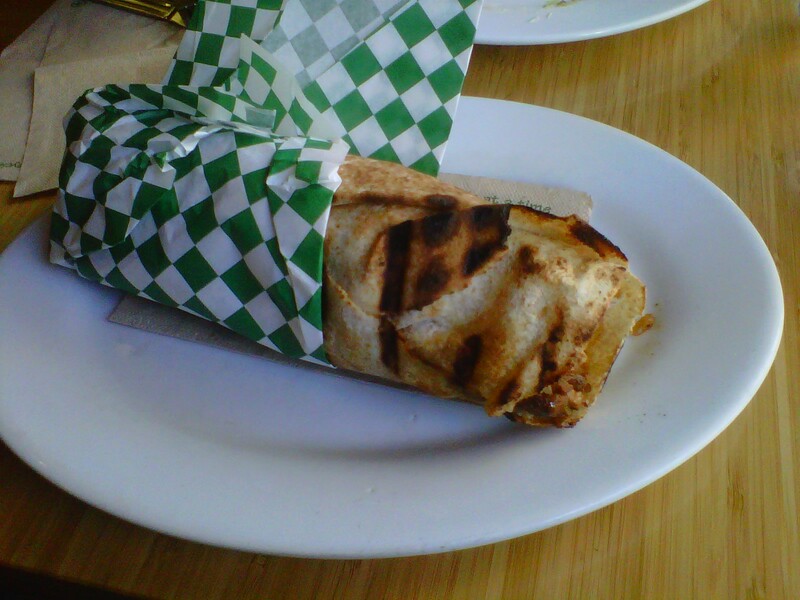 All of that taste bud tickling awesomeness was wrapped up in a crispy thin pita with chick peas, hummus, shredded pickled beets, lettuce and a little hot sauce for good health. The flavor that the Musakhan brings to this dish is intense but not over powering, a little citrus from the beets balances out the taste and the chick peas and hummus add a nice creamy texture with a garlic twist. The next time I head for Nuba I am definitely going to try a falafel plate as they looked amazing. Another thing that really caught me off guard was the water offered at Nuba. There were 3 jugs of chilled water for customers to enjoy, one was straight up, one had lemon wedges and the third had cucumber slices. Most places that give free water as opposed to selling bottles (which they also do) don’t offer a selection of water but they should!!! Water with cucumber slices is probably the most refreshing thing on the planet, if you’ve never tried it I strongly suggest you do. Thanks so much to everyone who takes the time out their busy lives to read about my adventures with food, it means the world to me!!! Located at 1002 Seymour street in Vancouver, Commune Cafe is a trendy new spot located in a very competitive area in the Downtown core. Just a block from Granville street and a few blocks from Davie street the competition is fierce ranging from 24 hour pizza shops to sushi to fine dining, it is a tough place to have success as a new kid on the block. Commune Cafe sets it self apart by using free range meat and eggs, organic milk products and produce, locally sourced 100 percent sustainable seafood and is a member of Oceanwise and Greentable. I have been to Commune several times over the last few weeks as I am working in the area. The coffee is good and the breakfast pannini’s and croissants are excellent, especially with the free range turkey sausage. The lunch pannini’s are also good but at around $8 for a sandwich that really isn’t that big I think there are better lunch options very near by. The breakfast sandwiches come in at around $6 which is also a little on the high side considering there are restaurants in the area you can get a full breakfast for a dollar more. That is my main concern with Commune. The food is quite good and given the building they are in, a high-end furnished hotel for the wealthy, the prices may seem ok for downtown but it’s quite easy to find good food for less money in every direction from Commune’s front door. The decor at Commune Cafe is very minimalist, modern and cool with banquette seating along the windows, a large communal table running down the spine of the restaurant and a large patio. The staff is mostly friendly apart from a certain staff member from “down under” who really seems inconvenienced by any customer. The General Manager is in the restaurant quite often and the service and food quality seems to improve when he is there which is a little worrisome. 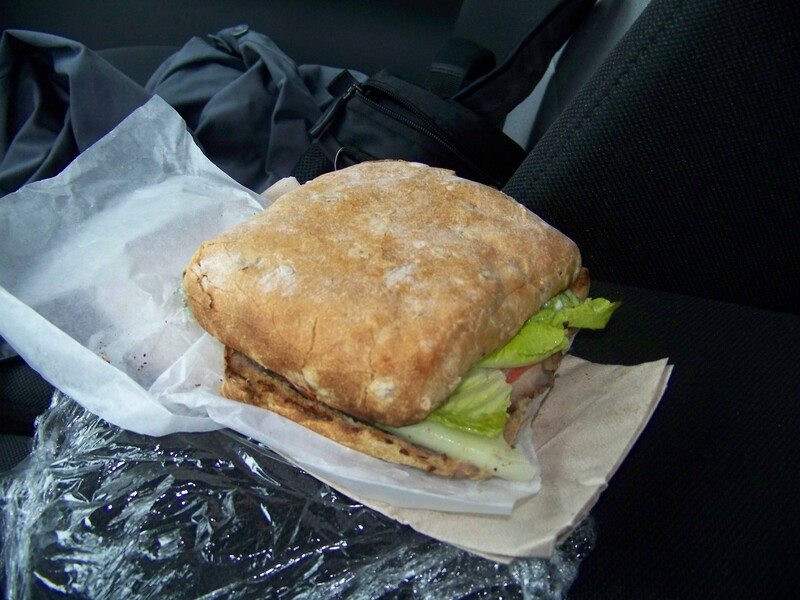 Mistakes in ordering are quickly cleared up and on one occasion GM Anthony Starns gave us a complimentary sandwich due to the kitchen mistaking rosemary ham for prosciutto. 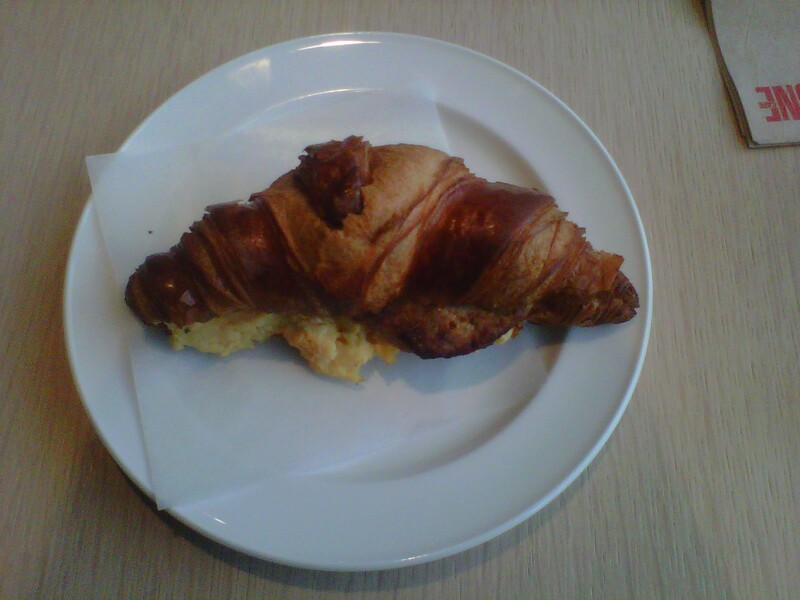 I think Commune Cafe has great potential given its location and its commitment to quality food. All new restaurants go through ups and downs during their formative months and hopefully Commune Cafe gets the kinks worked out soon, and maybe have a look at the sandwich prices while they’re at it.